Spring is the movement of the stonefly nymphs in the fast water and the hatching of the first stoneflies. It is the stirring of the salmon alevins up through the gravel, their emergence into huddled clumps still vaguely orange from the partially absorbed yolk sacs, their spread though the river as fry and the flight of most of them to salt water through a gauntlet of trout and mergansers, bullheads and loons and kingfishers and their own yearling relatives. 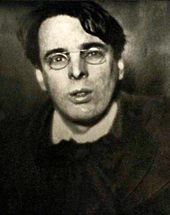 It is in the slow warming of the lakes, in the steady increase of the rivers as the snow comes off, in the rain showers and mayfly hatches, in the occasional days of storm and bitter wind more savagely chilling than the worst of winter, other days of flashing life and color more brilliant than summer’s richest. Spring is bloom of dog-tooth violet and trilliums along the flood-swept river banks, it is the scarlet of the sapsucker’s breast, the flight of the bandtail pigeons, the return of the yellow warblers to alders and willows overhanging the water. It is the geese nesting on little lakes, mallards paired on the beaver ponds, frogs croaking in the swamps. It is the rediscovery of pools and shallows changed or unchanged by a winter of weather, sudden freedom from the heavier gear of winter fishing, freedom from the restraints of snow and ice and short days; it is the whole promise of a new season ahead and the new pleasures that one knows will come, all unexpected from the familiar sport of going out beside water with a rod. Christi Belcourt is a Métis artist from Alberta, who was raised in Ontario. She is part of an artistic and family known for their art and Indigenous rights advocacy. For those who don’t know, the Métis are one of three peoples legally recognized as aboriginal or indigenous, by the Canadian government. The other peoples are the First Nations (Indians) and Inuit. Métis floral beadwork, Belcourt uses the subject matter as metaphors for human existence to relay a variety of meanings that include concerns for the environment, biodiversity, spirituality and Indigenous rights. 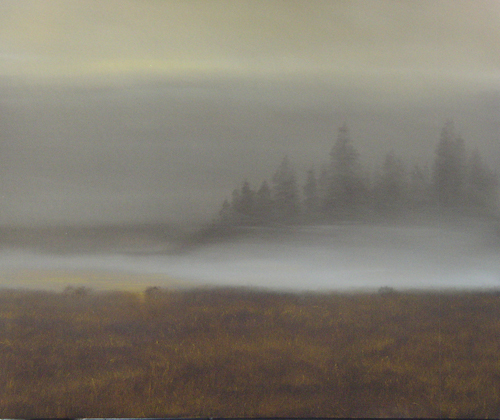 Although known primarily as a painter, she has for years been also practicing traditional arts. You can find many examples of varied artwork at her online gallery. Besides the pieces you can find in the gallery, Belcourt also creates a great many graphic pieces, related to Indigenous rights and environmental protection. She makes these available for public use. Once such piece, posted recently on her Facebook page, particularly caught my eye. This image addresses the “Trans Mountain” pipeline system. The Kinder Morgan cooperation is attempting to expand the capacity of this pipeline system, which will increase the environmental degradation at the Tar Sands of Alberta, where it originates. The pipeline ends at the Salish Sea, in British Columbia, and thus crosses a great deal of aboriginal Canadian land. The majority of First Nations along its pathway oppose the construction, because of the damage done at the Tar Sands as well as the possibility of further damage along its route (the pipeline has had numerous leaks, in the past). Belcourt’s art implies that the salmon of British Columbia also oppose the Trans Mountain pipeline. This may seem like an odd claim to mainstream Canadians and Americans. However, traditional Indigenous peoples typically recognize animals as non-human persons, with whom they maintain reciprocal relations. Ancient stories often tell of agreements made between the Creator, culture heroes, or game animals themselves and humans. Generally speaking, these agreements stipulate that the animals “consent” to give their lives to humans, if they, in return, are honored and their overall populations protected. For a far more detailed explanation of such reciprocal relationships, I recommend the book Animism: Respecting the Living World (Columbia University Press, 2006), by Religious Studies scholar Graham Harvey. I think many anglers can understand the relationships described above, even if we do not necessarily see animals as fellow persons. After all, a concern for conservation is reflected in angling literature dating back over 500 years in Europe. Authors emphasize the need to care for fish habitat and even to respect the fish (the latter need is particularly clear in Izaak Walton’s 1653 Complete Angler, in order to enjoy their sport). 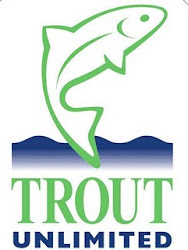 Today, many anglers join organization like Trout Unlimited or Backcountry Hunters and Anglers in order to “give back” to the fish. In general, though, most Canadians, Americans, and Europeans are not very cognizant of the impact their actions have upon others–even their fellow humans. Drawing from her own people’s views, and those of other Indigenous Peoples, Belcourt urges us to do otherwise. I should add that we must do so, being fully prepared to consume less energy (lest any readers accuse me of hypocrisy). Make no mistake, while I am not the perfect person, I do consider the consequence of my actions regularly. Much of my attention at work, lately, has been directed toward a project involving grizzly bears. 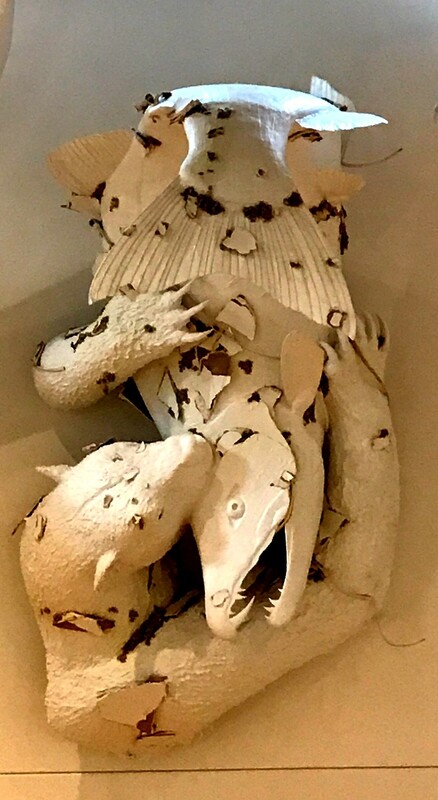 In thinking about the species of bears that roam the Americas, I was reminded of a piece of art I saw recently at the Northwest Museum of Arts & Culture, in Spokane, Washington. It depicts one of the ancient, now extinct “short-faced bears” (Arctodus pristinus and Arctodus simus) wrestling with the also ancient and extinct “sabertooth salmon” (Onchorhynchus rastrosus). The massive sculpture, which is mounted on a wall, was created by artist Peter Thomas of entirely recycled materials. It is part of a larger, permanent exhibit of Thomas’ work. Not surprisingly, these animals were massive. One species of the bear, Arctodus simus, may have stood 12 feet tall, while the salmon may have reached nine feet in length. Of course, the salmon is related to today’s Pacific salmon, while the short-faced bear’s closest living relative is the much smaller Andean “spectacled bear” (Tremarctos ornatus). Both of these animals roamed the waters and wilds of the Pacific Northwest. They were not actually contemporaries, but I still enjoy imagining what it might be like to land a giant salmon with huge teeth, while looking out for an even bigger bear that might want to steal my catch. My regular job involves promoting Indigenous land-based knowledge, often called in academia “Traditional Ecological Knowledge” or “TEK.” This knowledge is typically rooted in observations of the non-human world that are passed down, interpreted, and applied over many generations by members of Indigenous communities. Often, I find hard scientists to be the most receptive to collaborations with these communities, that incorporate such knowledge. In fact, some of the collaborations that come to mind have involved beavers, and were led by a Native American professor. It is encouraging to see fisheries scientists looking toward non-human models of trout stream restoration. Sometimes the best solutions to a problem are those that have worked in the past. The Western obsession with human ingenuity sometimes distracts us from this fact. The video accompanying Elliots’s article is below. Charles Eliot Goodspeed opened Goodspeed’s Book Shop in 1937. His Boston store grew to be one of the most respected antiquarian book shops in the United States, and it was in business until 1993. Goodspeed cared not only about books, but also about fishing. As biographer Walter Muir Whitehill puts it, Goodspeed was “a devout disciple of Izaak Walton.” No doubt, this prompted Goodspeed to compile a massive collection of new and previously published fishing essays. This collection was published in 1946, as A Treasury of Fishing Stories (New York: A.S. Barnes and Company). 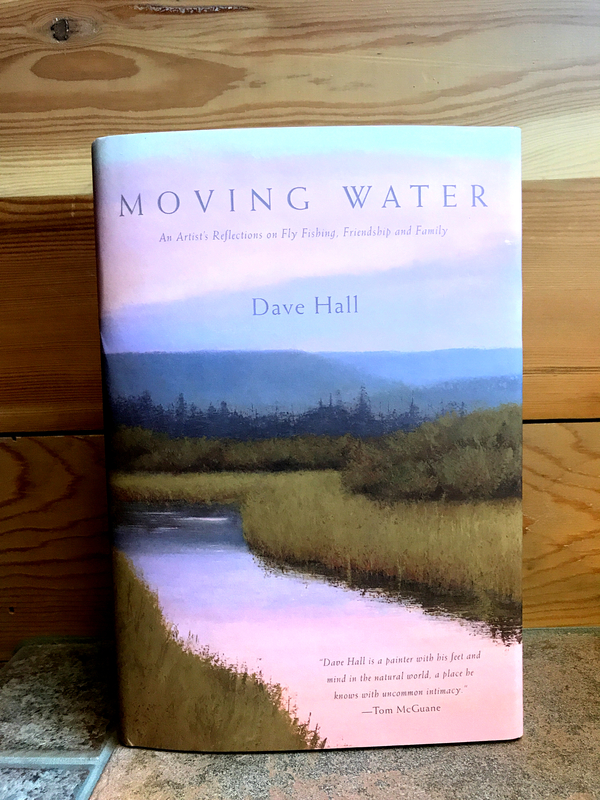 According to the book’s “Acknowledgements” section, Goodspeed gathered most of the previously published selections from a collection of fishing works left to Harvard Libraries by Daniel Butler Fearing. Among the sometimes obscure, other times famous, and almost always incredibly entertaining pieces that Goodspeed includes in A Treasury is one by Francis Francis, angling editor to the English sporting magazine The Field and author of the well-known A Book on Angling (1867). The piece that Goodspeed includes is titled “Christmas in the Fisherman’s Snuggery,” from Francis’ Hot Pot; Or Miscellaneous Papers (1880). A Fisherman’s Snuggery — What is it like? A squarish room, about 16ft. each way, low rather than lofty, with recesses on either side of the fireplace, and a glazed bookcase in each — one containing a choice collection of works upon angling, ancient and modern, and the other a good selection of works upon natural history, botany, geology, and kindred sciences; for your true angler should always have a love for Nature and her secrets, and should study how to unlock them. Below the book-cases are chiffonnières [sic], with cupboards. In one long drawer, with a let-down flap, is contained in various small drawers and pigeon-holes the entire arcana of bait fishing, and in the other of fly fishing. Both are open this Christmas day, and a loving ramble amongst their contents is going on. I know that I would certainly have enjoyed some time in George’s snuggery. 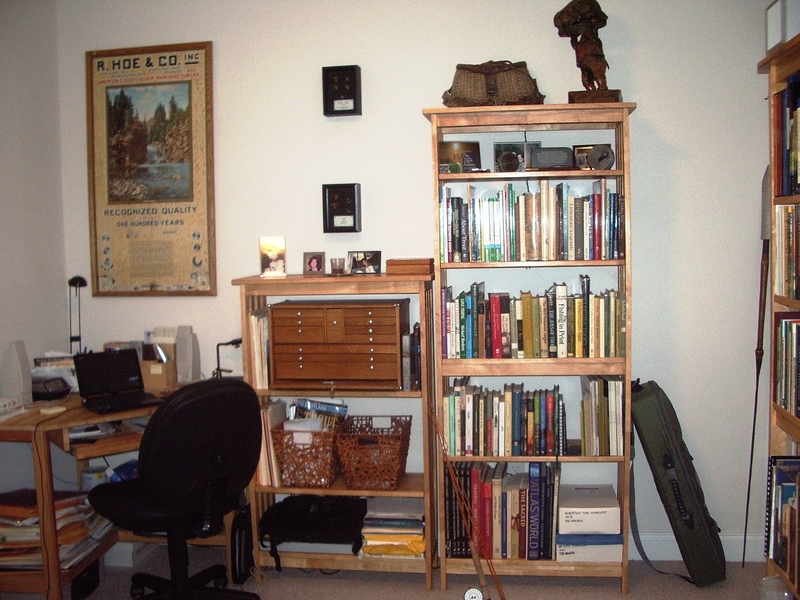 There are few activities that I love more than perusing the fishing books and tackle in my office, which is, no doubt, infinitely more modest in design and contents than George’s sporting sanctum. Enjoy the winter holidays, fellow anglers. Walter Muir Whitehill, “Charles Eliot Goodspeed,” Proceedings of the Massachusetts Historical Society, Third Series, Vol. 71 (Oct, 1953- May, 1957), p. 362. Francis Francis, “Christmas in the Fisherman’s Snuggery,” in A Treasury of Fishing Stories, compiled by Charles E. Goodspeed (New York: A.S. Barnes and Company, 1946), 193-194. 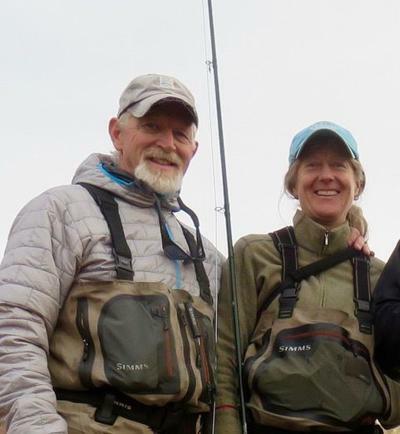 Today’s Missoulian, the local newspaper of Missoula, Montana, features an article on legendary Montana fly fishing figure Norman Means, aka “Paul Bunyan.” Means is probably most widely known as the creator of the “Bunyan Bug” fly, fished in Norman Macleans’ A River runs Through It. The article, by Kim Briggeman, is based upon the many mentions of Means in various editions of the Missoulian published during the last century. A Means tied Bunyan Bug and a Jack Boehme Balsa Bug. 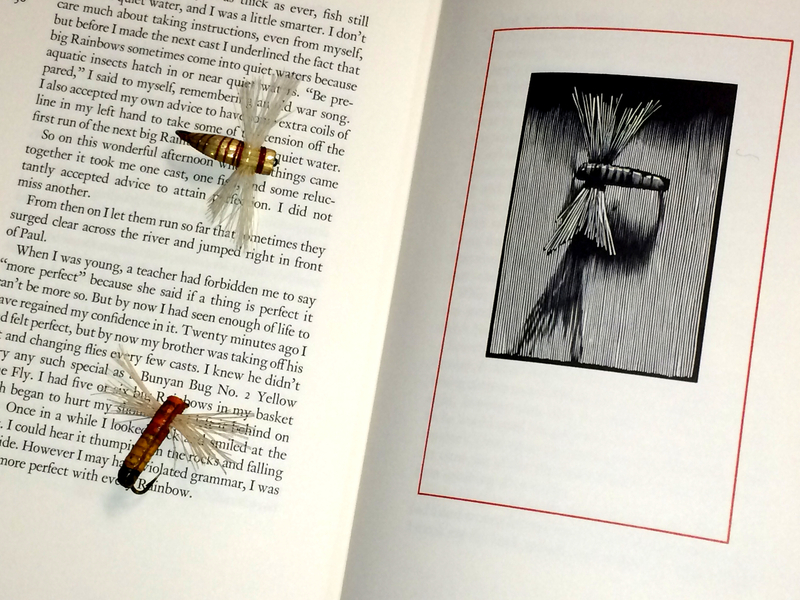 They sit on a 1989 edition of A River, featuring wood engraved illustrations by Barry Moser. Boehme was another renowned Missoula fly tier.